Update 04/02-2017: Fixed minor bugs. Finally, after a long time i'm done with my first pico8 game. I was in way over my head with this game. Making a huge platformer as a first project = bad idea. I dedicated this game to my father who's birthday is coming up soon. 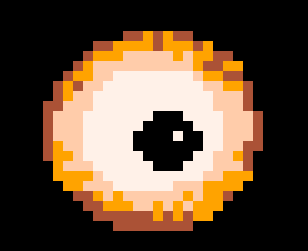 I also made this game because of my fear of eyes. Anyway, I hope you enjoy the ride! If you find any bugs, please tell me! Huge shoutout to ElastiskaLinjen who kept me going with this. I would never have done this without him! Check out his games here on pico, they are pretty darn sweet! Nice game, I enjoyed playing it. The sprites are pretty good and the mountain background reminded me of Yoshi's Island. The rain and dust effects are also a nice touch. Being able to skip text boxes would have been nice and maybe a special ending if you manage to beat the game unscathed? the scrolling is troublesome. it should happen before you hit the edges (keep the player in roughly the middle third of the screen). very nice and polished otherwise! As for the bugs, thank you for reporting them, i'll look into those things :) I tried to fix all bugs before releasing, but it's tedious. Easier if other people play it and report back, so thank you! @ultrabrite, Yes you are correct, I'm looking into rewriting the camera scrolling a bit. It's been tedious making it work this far hehe. Otherwise thanks for your kind words! So great that it is finished! @Elastiskalinjen, thanks! Np for the shoutout, you deserve it! love the game mechanics here! I ran into a bug where the game froze after I respawned about 3 times at the same savepoint though. @tepuitrouble Thank you for your kind words! Seems odd that the game froze. Do you remember on what floor it occured?